Super Heroes! Cyborgs! Pirates! Cultists! Sentient Mildew! Republicans! This one has it all! It all starts one night at the Floating vagabond (don't they all?) when someone threatens to blow up the bar. If the patrons want to save the only drinking establishment that extends them a line of credit, they must embark on a whirlwind tour of devastation, trickery, and bad jokes. Add to this mixture Captain Carnage and Ms. Missile ( a pair of well-meaning but inept super heroes), a band of ruthless but fashionable space pirates, and one of the sorriest excuses for a Jihad ever, and blend thoroughly. 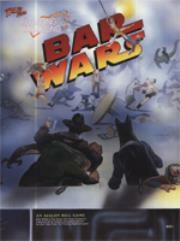 This Tales from the Floating Vagabond supplement includes the star-spanning adventure Bar Wars, super hero rules, so players have powers far beyond those of mortal men, cybernetics rules, so players can replace their favorite body parts, bar-room brawl rules, so players can beat up on each other, a big, two-sided color map with the Floating Vagabond on one side and the Crane's Nest on the other, a bunch of full-color, stand-up figures to use with the brawling rules to scatter across the floor, and, more rules!